It is not easy to be the actress indelibly associated with a tiny, gold bikini. The bikini that barely fit back in the '70s is now an awkward reminder of how everyone changes over time. In the 30-some years since her Princess Leia role in Star Wars, Carrie Fisher went from 105 pounds to 180 pounds. That was a pretty dramatic change, given her 5 foot 1 inch frame. Now she is 50 pounds lighter and the new spokesperson for Jenny Craig. How did she do it? Carrie Fisher credits her sense of embarrassment about her figure for sparking her interest in dieting. That meant giving up her favorite snacks of Coca-Cola and peanut butter bars in favor of Jenny Craig prepared foods. Starting her diet in November, she initially hoped to lose 30 pounds. Nine months later, she has lost 50 pounds. In addition to living on Jenny Craig meals, she exercises 45-60 minutes a day during the week. Her favorite exercise equipment? Her elliptical machine. Her least favorite? The treadmill. She credits her personal trainer for much of her success, but says that she has "given up" on getting her arms and chest back to their former shape. Another success factor: her mother and her daughter joined her in the Jenny Craig program. With diet buddies like that, she had a lot of encouragement and support. Plus, her public lifestyle created a photo montage of her weight loss, commemorating her milestones and continuous improvement in her appearance. 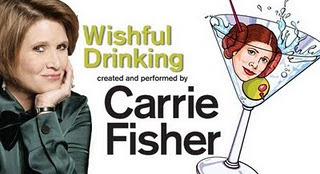 Now, the slimmer Carrie Fisher is touring with her one-woman play called Wishful Drinking and preparing for the release of her sixth book. In her typical comedic manner, she has a chapter in the book titled, "Wishful Shrinking." Are you ready to try on Princess Leia's gold bikini? Get yourself a diet buddy at WannaBuddy.com and get back your bikini body!